The government on Tuesday endorsed the 'Delta Plan 2100', identifying six key areas of intervention for achieving Bangladesh's upper middle-income country status. 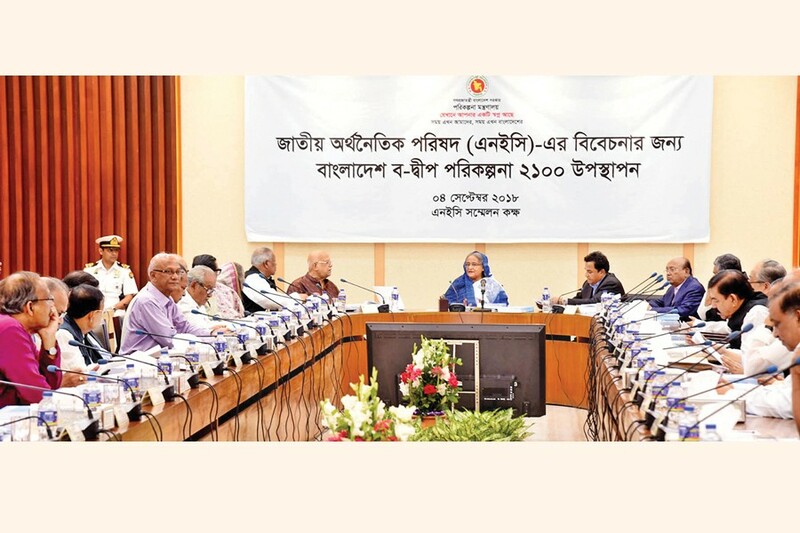 Presided over by the Prime Minister, Sheikh Hasina, the National Economic Council (NEC) approved the plan at its meeting at the Planning Commission in Dhaka. The coastal, Barind, drought-prone, haor and flood-prone, Chittagong Hill Tracts, riverine, and urban areas are the fields, which have been identified as the hotspots under the plan. In the short-term through the financial year (FY) 2031, the investment equivalent to 2.5 per cent of gross domestic product (GDP) will be required for addressing the impact of the climate change and poverty reduction. After the meeting, planning minister AHM Mustafa Kamal said that the plan would tap Bangladesh's huge potentials as a delta country through addressing the climate change impact, water resources management, while ensuring food and water security and tackling disasters. Mr Kamal said that the country would require some $37 billion funds by 2031 for implementing nearly 80 projects under the Plan. The plan will be implemented by 2030 in the short-term, 2050 in the medium-term and 2100 in the long-term. Meanwhile, General Economics Division (GED) member Prof Dr Shamsul Alam presented details of the plan at the NEC meeting. Prof Shamsul Alam said that the plan would expedite Bangladesh's economic growth and bring down the poverty rate to zero. By 2031, Bangladesh will graduate to the upper middle income country (UMIC) status from the current lower tier if the plan is implemented properly, he told the FE. Besides, the plan has a target to help the country grow at 9.0 per cent on an average by 2031 and the poverty will be cut to zero per cent by 2027, he said. He said this is a "red letter day" for Bangladesh as the plan is unique in the world in terms of its longer version of development document. Mr Kamal said based on the experiences of the Netherlands, the Prime Minister had earlier directed the authorities concerned to frame such a plan to tap the maximum potentials of Bangladesh as a deltaic region. He noted the Netherlands has benefitted largely through adopting such a plan as the European nation had been able to reclaim around 6,000 square kilometres of land in addition to their mainland. "We firmly believe that our most important resources is the water resources. If we could properly utilise these resources, then we will certainly not lag behind in agriculture and Bangladesh will grow much stronger economically," the minister added. The minister said the Planning Commission is working towards framing another perspective plan for the year 2021-2041 to transform the nation into a developed one. Prof Alam said some 133 projects have so far been selected for execution under the delta plan. Out of those, some 80 projects have been selected for the implementation, which are directly related to climate change and water sector related. The GED has prepared the plan with the assistance of the Dutch government and the World Bank. For implementing the plan, a high-level Delta Governance Council, led by the Prime Minister, would be formed. The planning minister would be its Vice-President. The council would make decisions and give directives for implementing the plan. Besides, a project or operations selection committee, led by GED member, would be constituted. The secretaries of the ministries related to the plan would be committee members, who would select projects and programmes. The committee would also monitor implementation of the projects and programmes.